2013 promises to be an interesting year in all sorts of way, and some racing is going to feature somehow. 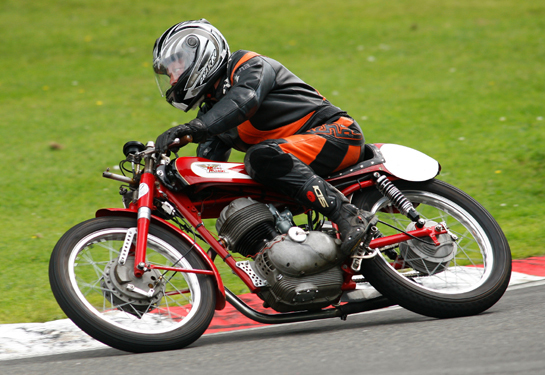 The Cub is relatively fit for service, and while not fast enough for the longer circuits, may be able to hold its own at Brands Hatch, where the CRMC season kicks off in March. If Jenny's Honda is ready in time for that meeting, I must be there to provide moral support, though if her Honda can be made to go as well as it should, I could be in for some embarrassment. The Daytona will not be ready by then, as it is being worked on to be made extremely pretty for events later in the year, here is evidence of the extremes to which am I going with this. It should certainly surprise and impress the CRMC scrutineers, if nothing else. 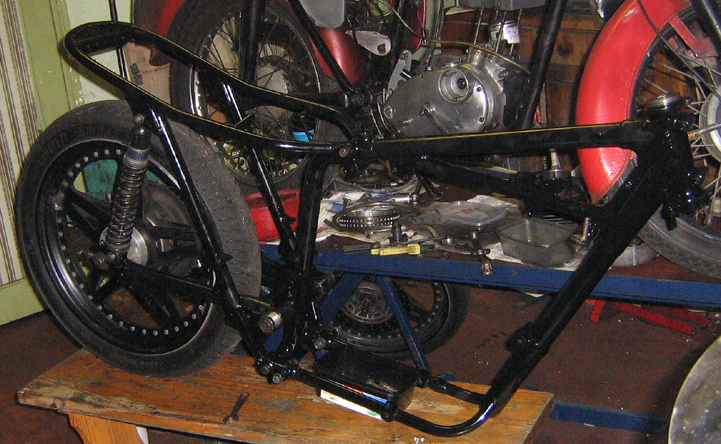 In the background the Cub sprint engine is returned to Sally's road bike in preparation for its forthcoming MOT. 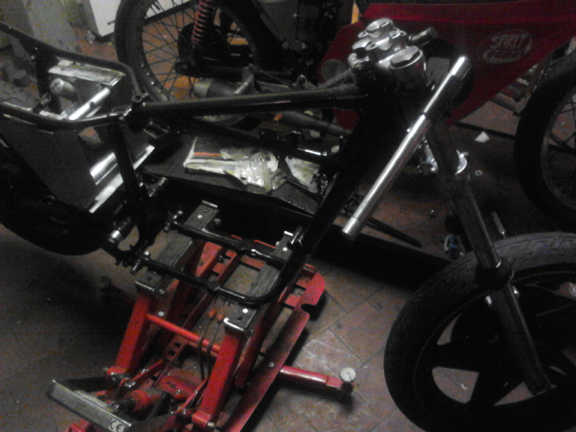 The now very shiny forks are re-attached. 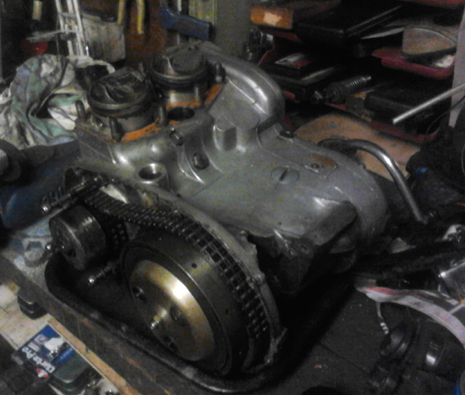 The engine about to be dropped back in the frame to get ready for sending down to Luton Paul for the new exhaust system to be manufactured. Once upon a time, long ago - at the beginning of the year - there were exciting bike plans for 2013. Then the lease renewal didn't go as expected, and here we are in a new (in a Georgian sort of way) shop. Outfitting a shop and shifting a quarter of a century's accumulated stuff has not left a lot of time or energy for rebuilding bikes. Attendance at Brands Hatch had to be cancelled and the event was snowed off anyway. 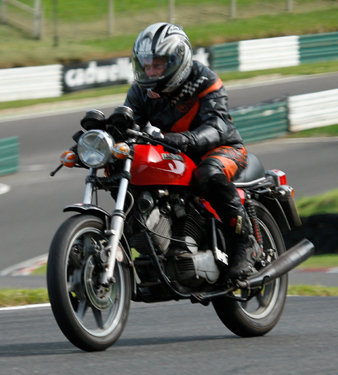 Darley Moor was next, and despite being only a week after moving into the new shop, the fact that the circuit is less than half an hour's drive away made a quick burst of therapeutic racing possible. The Daytona was still in a million pieces but the Cub had had a bit of attention after Silverstone last year, including dropping the gearing for Brands. With a bit of luck it would still suit Darley, so the tyres were pumped up and the battery charged and off we went. And fun was had. The Cub, we know, is not currently fast enough to cope with the latest Hondas. 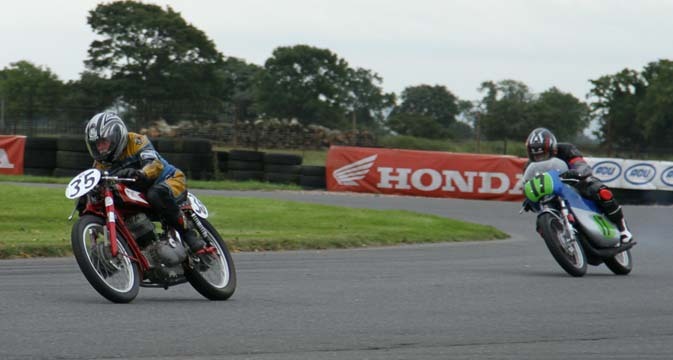 However, there was a new chap on a Honda twin like the ones I used to happily dice with three or four years ago. 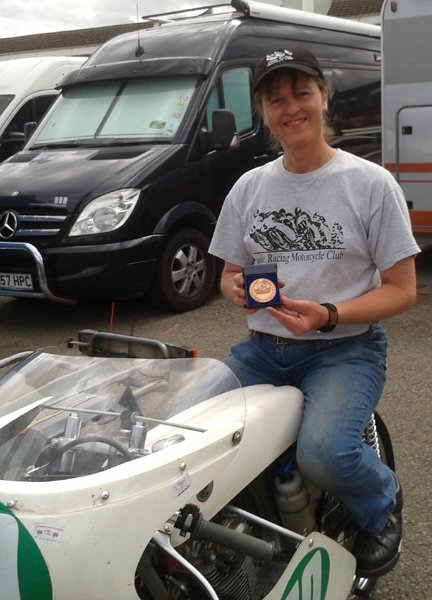 He was still faster on the straights, but as he was getting used to both the bike and the circuit, I was able to best him with the aid of some late braking. As he got better and better the braking got later and later and in the last race it all came down to another bike getting in the way and he got his revenge. Meanwhile Jenny's Honda still wasn't as fast as it should have been, but she was steadily getting more and more used to it. I could stay ahead, but not by much. 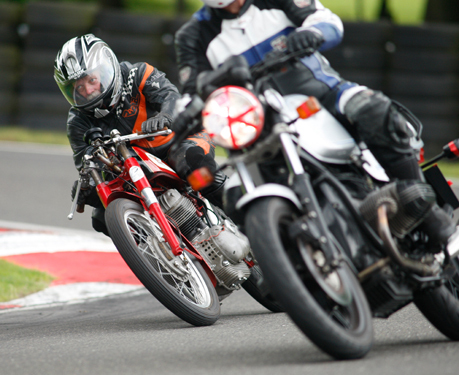 I was not able to join Jenny at Pembury and neither of us could make it to the Anglesey circuit, but a trip to Cadwell Park for the Morini Club track day at the end of July was essential, as we have an exciting new development. The Paul behind the original aborted Morini racer project back in 2008 has bought a 1954 Settebello racer with a view to parading it and lending it to me to race too. Amidst the continued excess of shop-related work, I managed to do a bit of required fettling, not least fitting a silencer as it still had the original pre-noise-regulations megaphone. The fairing also needed modifying, but it was decided to leave it off for the moment making it easier to get at any bits needing adjustment. 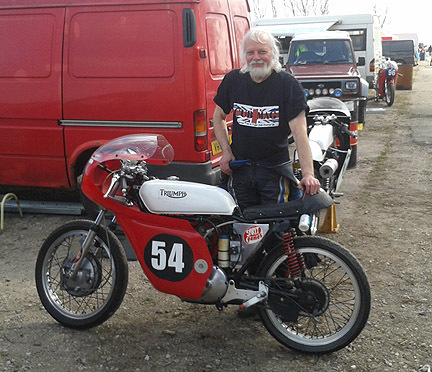 I also found time to get the 900cc Triumph road bike MOT'd so that I could ride that to the circuit, and the Cub once again had the tyres pumped up and the battery charged. I also removed the sump plug to check that oil rather than bits of metal came out, as the engine is sounding a bit knocky. 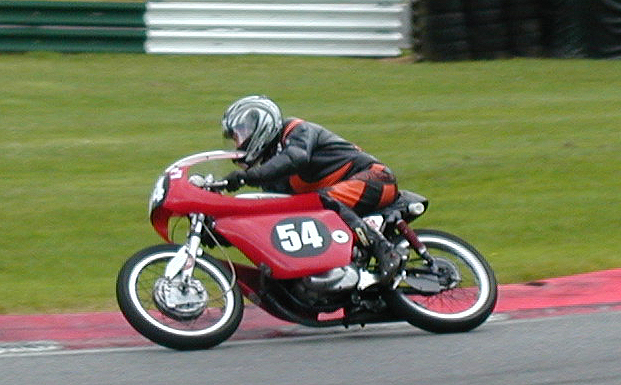 Up at Cadwell, the Settebello was tried first - the handling and brakes were fine, but the engine would not go above half revs. Happily, we had a Settebello expert on hand, who pointed out that the highly tuned engine needed the clearest possible route for its exhaust gasses. The Cub was given a run, which was enjoyable was worryingly rattly, so it was robbed of its silencer, which suited the Settebello much better. 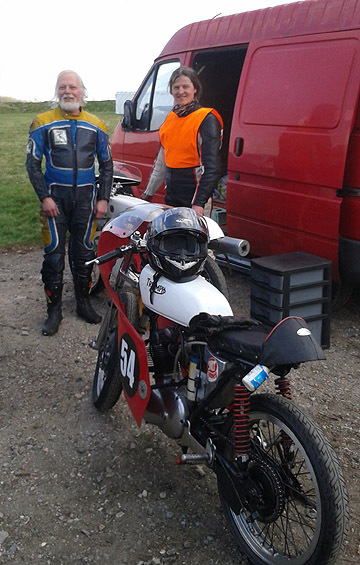 For the final couple of sessions I was allowed to borrow Paul's road bike, a Morini 3 1/2 Sport, which goes very well indeed. 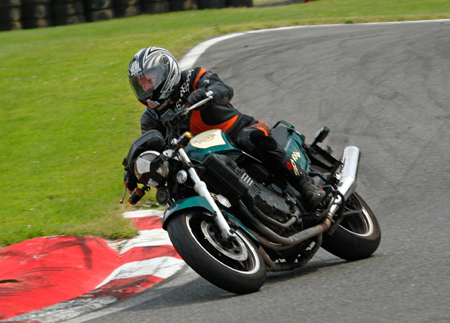 By the end of the day I had had 7 sessions on 4 different bikes, in glorious sunshine - what more could a lad want? Her silencer only just made it back! The last event of the season, for me, was Thunderfest. As related in last year's write-up, this is a time trial rather than a proper race, but is still mainly an excuse for going as fast as possible. Last year on the Daytona that meant being third fastest overall, this year I was on the Settebello to see how the lap times compared with the Cub. The weather threatened to interfere with this plan; previous laps had been in the dry so if it rained, there would not be an accurate comparison. The forecast rain also made it highly desirable to put new tyres on. These were ordered for early in the week but after some chasing up eventually arrived on Saturday, I changed the front tyre in the evening but there was plenty of scope for disaster changing the back tyre so the old one was left on. So long as I had confidence in the front end I was happy enough. Come Sunday morning the weather was tenuously holding and the practice sessions were dry. The first objective was thus achieved, though sadly the times were much slower than hoped for. Some of this could be accounted for as some extra caution on someone else's expensive toy, but it also suggested that the bike is simply not as fast as the Cub. Damn. 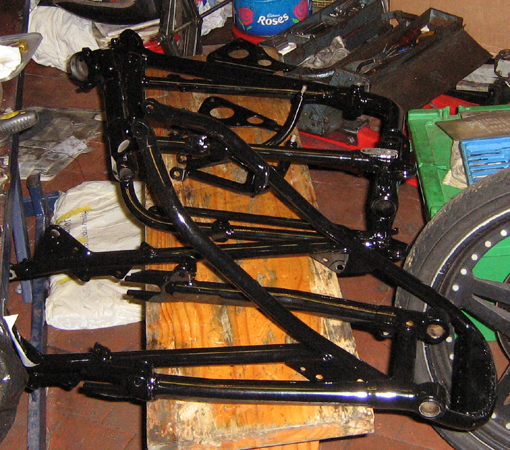 Further fettling may help, but the Cub is due for some of that too. Over lunch it became clear that the forecast for rain in the afternoon was going to prove accurate, and for me this was good news. With my nicely scrubbed-in new front racing tyre I was likely to get my revenge on the larger, faster road bikes that had come past in the dry sessions. And I had gambled on the rain arriving when stating the speed I would be aiming for in the afternoon timed session, so maybe this year I could get it right and win a coveted plastic trophy! 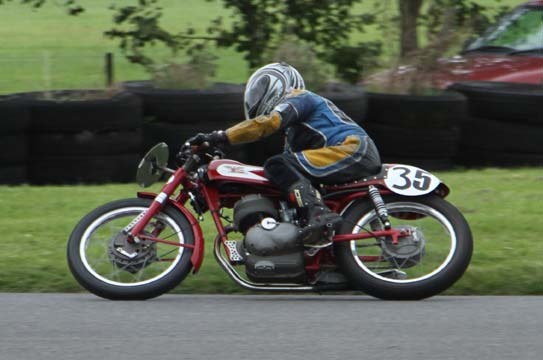 Alas, my enthusiasm was not matched with common sense - being used to the Cub behaving in the wet I had forgotten to carefully waterproof the electrics on the Settebello, and the bike came to a halt halfway round the warm-up lap. 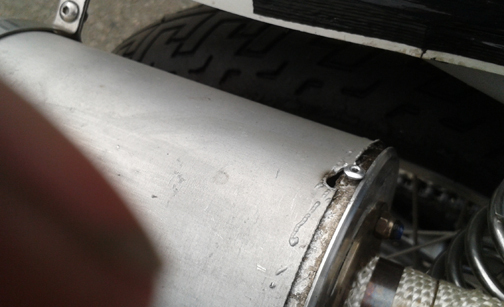 I should have spotted that the previous owner, in making it look neat and pretty, had run the HT lead close to the cylinder head fins, and although there was a waterproof cap on the spark plug, a small rubber cover was missing which allowed the spark to arc across. So this is the way the season ends, not with a bang but with a splutter... Ah well, roll on 2014.